Managers face one of the toughest challenges in motivating their sales team, to improve their performance. It needs amounts of attention to maximize the team performance as it reflects on their own success. It is treated as a big challenge because there is no generalized formula for increment of their subordinate’s motivation. The factors vary depending on the person and factor that motivates one person need not necessarily motivates the other person too. Let us find them in the coming chapters in detail. 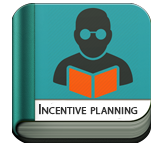 In this tutorial, we will learn about Incentive plans and their role in motivating the employees. Managers who are in need to create a motivation-oriented environment for their team members. You must aware of the basics of an organizational structure and the working model of your company.